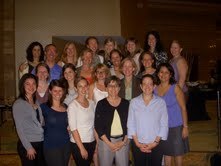 The 2011 International Conference on Eating Disorders was held in Miami, Florida last week, April 28-30. Close to twenty members of the clinical and research teams of UNC’s Eating Disorder Program joined hundreds of other professionals and advocates from around the globe engaged in research, treatment and prevention of eating disorders. This year’s conference theme, The Complexity of Eating Disorders: Many Perspectives, One Shared Goal was exemplified in the keynote address by Dr. Timothy Walsh from Columbia University. His talk entitled The Diagnosis of Eating Disorders: The Good, the Bad, and the DSM-5 discussed proposed changes for the future in the way we classify eating disorders, in particular trying to decrease the number of individuals who are given a diagnosis of ‘eating disorder not otherwise specified’. Other topics discussed by conference attendees from around the world included: 1) New Treatment Research on Eating Disorders, 2) Is Food Rewarding for People with Eating Disorders? Clinical Insights from Brain Imaging Studies, 3) “Growing Up”: An Update on Adolescent Eating and Weight Disorders, and 4) Public Policy Approaches to Eating Disorder and Obesity Prevention: Global Perspectives. More information on specific talks within these sessions can be found at http://www.aedweb.org/Plenary_Sessions.htm. For the first time this year, the conference included a session completely devoted to discussing recent research on pregnancy and motherhood in women with eating disorders. UNC’s own Dr. Stephanie Zerwas, Assistant Professor and Associate Research Director of the UNC Eating Disorders Program, presented findings from her recent study of maternal weight trajectories during pregnancy and the postpartum period. She found that mothers with eating disorders gained weight more quickly during pregnancy than mothers without eating disorders and that mothers with anorexia nervosa or bulimia nervosa lost weight more quickly in the first 6 months post-partum than mothers without eating disorders. Her findings highlight the need for a better understanding of eating disorder recovery and relapse during this critical period. Brazilian psychiatrist Dr. Andrea Pinheiro, a former post-doctoral fellow at UNC, presented two studies evaluating disordered eating behavior during pregnancy in women living inBrazil. She found that women who reported binge eating during pregnancy were at higher risk for having adverse birth outcomes than women who did not report binge eating during pregnancy; she also found that disordered eating behaviors decreased for most women during pregnancy, but resumed postpartum. Abigail Easter from King’s College London discussed dietary patterns in the children of mothers with eating disorders, finding that these children were more likely to have a ‘health conscious’ dietary pattern compared to the general population in their sample of women and children from the UK. Another member of the UNC Eating Disorders Research team, Dr. Elizabeth Hoffman, MD/PhD trainee, presented findings from her study of maternal-child interactions in mothers with histories of eating disorders. She found that mothers with eating disorder histories displayed differences in their heart rate patterns during mealtimes and playtimes with their children compared with mothers without eating disorder histories which may indicate an increased susceptibility to stress. The inclusion of this session on pregnancy and motherhood in the program this year is promising, highlighting increased attention to this critical area as we work to develop a better understanding of the needs of women with eating disorders during this important time. ← Congratulations to Dr. Cynthia Bulik on receiving the 2011 AED Advocacy Award!